In my ISOBuster article, I wrote about how to rip *.ISO files from CDs and DVDs. If you used ISOBuster to do that with a protected DVD - which includes virtually all video and movie DVDs - you would have been greatly disappointed. In fact, if you ran the *.ISO file on a virtual disk or burned DVD, you would see something similar to the garbled mess below. Why does it do that? Commercial DVDs for Video are equipped with a slew of user limitation technologies like Macrovision, Content Scrambling System (CSS), region codes, and user operation prohibition. Studios utilize these technologies to prohibit users from copying the DVDs for distribution online or on disk. It’s the DRM (digital rights management) for video. Like I said in the previous article on unlocking the iTunes 7 DRM, I think it is stupid. There will always be a way to copy media. What if I want to make a backup copy on my computer or another burned disk? We all know how easy it is for a CD or DVD to get scratched up no matter how careful you are! This is where DVD Decrypter comes to the rescue. 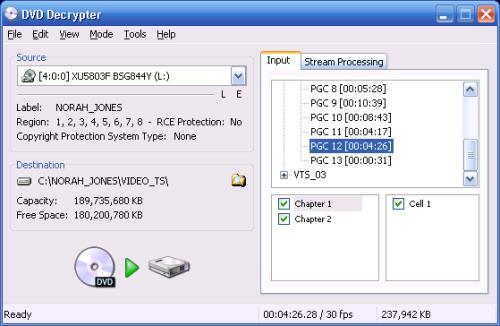 This program strips the DVD of all of its user-limiting technologies. It works in three modes: ISO, FILE, and IFO. This mode pretty much lets you do what you wanted to do with ISOBuster; it lets you rip the entire ISO image of the DVD without all the copy protection. If you know how to rip an ISO image, the process should be very straightforward. In this mode, it allows to copy individual files from the DVD. This may seem simple enough without all the hassle of DVD Decrypter. You might be thinking, “I could just drag-and-drop copy any of the files from the DVD in Windows Explorer. Not so. Somehow when you do that, the copy protection comes with those files. 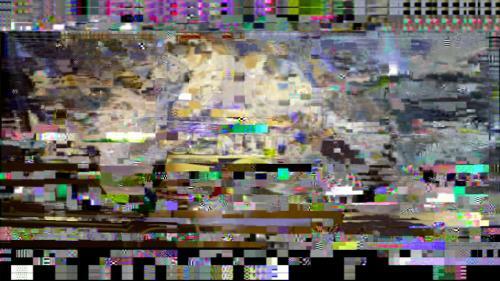 In the end, you will continue to see that garbled image. This is an interesting mode. When surfing through the DVD menus, you are given a greater range of functions and features than just the plain-jane play, pause, fast forward, and rewind in VHS cassette tapes. With DVDs, you can skip chapters, add subtitles, hear the director’s commentary, switch to surround sound, see behind the scenes, or view at a different angle. If you know what you are doing, IFO mode lets you copy just what you want to see. If you want one particular scene in a different angle with the director’s commentary, IFO mode will allow you to specify that. If you only want a feature about the making of the movie, IFO mode will allow you do rip just that clip. Please note that in some jurisdictions, DVD Decrypter is illegal. I do not condone any illegal activites. This entry was posted on Wednesday, February 28th, 2007 at 3:11 pm	and is filed under Audio and Video, Hacks. You can follow any responses to this entry through the RSS 2.0 feed. You can leave a response, or trackback from your own site.